In documentul prezentat mai jos, reguli de arbitraj de karate in proba de KO-GO Kumite, am pastrat limba originala in care a fost publicat regulamentul initial pentru a transmite cat mai fidel nuantele si intelesul acestuia. Regulile de KO-GO Kumite sunt obligatorii pentru examenele de arbitru de karate traditional, shotokan - fudokan. Ko-go Kumite is a specific form of Kumite competition which designates competitors as either Offense or Deffense at the start of each match. Competition is divided into six matches. Each competitor is designated "offense" three times and must initiate attack. The other competitor is designated "defense" and must respond to the attack. On elimination chart: AKA is placed on top, SHIRO is placed on bottom or AKA on right side of chart, SHIRO on left side of chart. In cases of HAN-SOKU, SHI-KKAKU, Doctor's Stop or Withdraw, no more matches take place. Opponent is declared the winner. This is repeating with two fingers for the second attack (NI-KAI) and after that, the third time, three fingers for the third attack (SAN-KAI). These commands are performing in one smooth movement of hand. Must begin attack within 10 seconds after HAJIME. After 1 0 seconds and no attack is initiated, this is recognized as JIKAN. When "offense" side's leading hand comes within estimated touching distance of Defense" side's leading hand; then "offense" side cannot hold both hands more than 45 down or hide both hands behind body line. If so, this is recognized as KAKUSHI. Can only initiate technique after "Offense" side physicals begin the attack. Any physical movement used as a feint or faking attack from "Offense" side is recognized as initiating attack. Verbal sound without physical movement is not recognized as an attack. If "Defense” side's initiates technique before "Offense” side attacks: this is recognized as SAKI. If attackers side leading hand can touch opponent's hand (touching distance) then, there is no need for "Defense" side to wait for actual "Offense" side to initiate defensive counter. In this case, "Defense" side can, in place, without body shifting block the "Offense" side's leading hand and then initiate contra attack. If "Offense” side has executed 4 attack techniques and "Defense" side only incompletely or ineffectively blocks (shifts to escape, this is recognized as "NIGE-TAI”. When "Offense side, using combination techniques, stops continuation within combination. When "Offense" side's combination four techniques are finished, or after "Offense" side's last technique, "Defense" side counterattacks and "Offense" side counter-counter attacks is over. When "WAZA-ARI” or “IPPON” is recognized. In case of Doctor's Stop. In case of unforeseen serious situation. At the end of each match, SHU-SHIN indicates competitors to return to starting positions, and then declares points, penalty or necessary direction. Then, SHU-SHIN continues with next match. At the completion of all six matches (three offense and three defense for each competitor), the SHU-SHIN confirms score with the KANSA, and then declares the winner. In case of tie score, immediately begin "KETTEI-SEN”. In case of violation of general Kumite Rules, other than the KO-GO Kumite Rules, SHU-SHIN gives the penalty after confirming with the court judges, without any informal verbal warning. 3 SAKI Index finger shifting from "Defense" side to "offense" side Top of flag shifting from "Defense" side to "Offense" side. 4 NIGE-TAI "Defense" side hand open with palm pushing backward "Defense" side flag, while pointed straight up, moves to side of body. 5 CHIKA-MA Bring both palms together, fingers up, in front of chest area. Bring both flagpoles together, tops pointed up, in front of chest area. 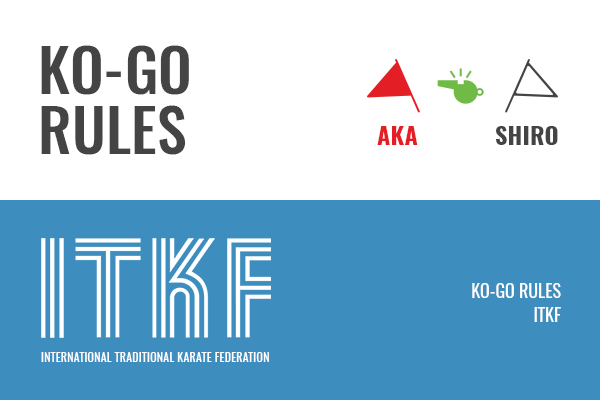 End of KO-GO Rules according ITKF.